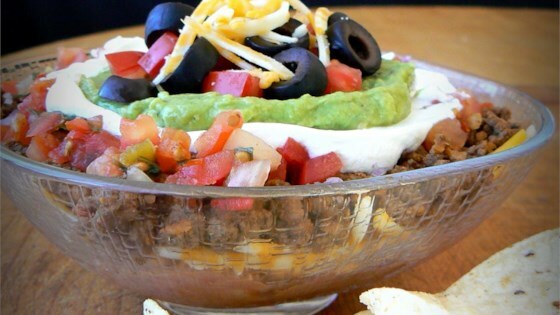 "This is a great party dip because it's best served at room temperature. You can set it out on the table early and finish cooking the rest of your meal." Excellent. I omitted the guacamole and upped the sour cream to 16 oz. Added 2 TBS of taco seasoning to sour cream. Thanks! I have made this dip many, many times :) Everyone loves it....it goes really fast!!! !I follow the recipe exactly and it turns out perfectly everytime! Great for any party!! !